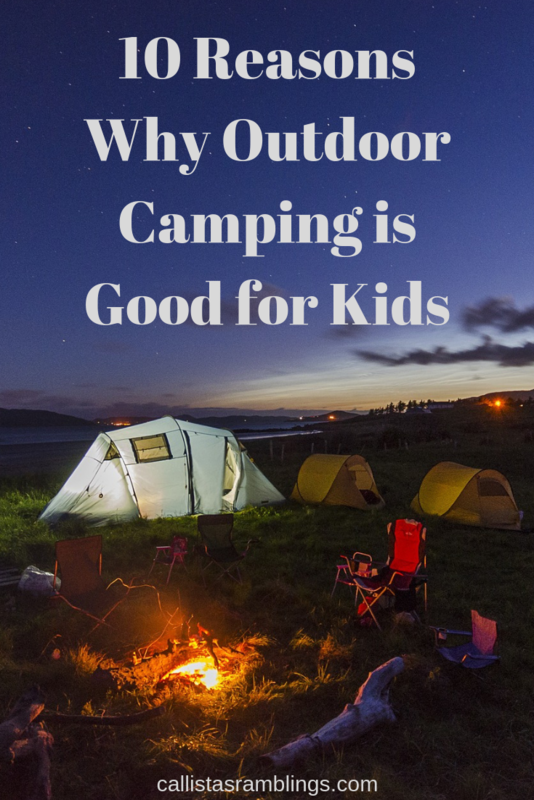 Camping is an activity every parent should consider doing with their kids. Being outdoors gives them a chance to be close to nature while they enjoy and get to learn a lot of valuable life lessons. Moreover, the experiences they gain can turn into happy memories as they grow to be more capable and resilient to life’s everyday challenges. This is a guest post by Shari. You can read more about her in the bio at the end. 1. Kids learn about the importance of effort and hard work. Being in the woods lets your kids step out of their comfort zones. While that can be worrisome, allowing them to be free with nature can be beneficial for them. They get to learn how to adapt to the environment they’re in and work for the things they need while they are camping. Also, they get to feel the accomplishments of eating from gathered foods, cooking by collecting firewood, and making fire from scratch. What’s more is that they get to be entertained and enjoy all these things without having to rely on electricity and technology. 2. They will learn what nature sounds like. Kids nowadays always have a way of entertaining themselves. With gadgets and the internet available all the time, they tend to overlook the importance of peace and solitude to have a healthy mind and stable emotion. Letting your children hear the sound of nature through the gentle breeze of air or the sound of streaming waters will make them learn how to appreciate what it’s like being one with their environment; teaching them the value of having themselves as their own company. 3. They learn to enjoy the real connection and quality time with friends and families. In the modern world, one of the advantages technology brings is it lets us connect quickly and easily with friends and families. While it may be a good thing, your kids while camping, on the other hand, will get the chance to get close and bond with the people dearest to them. Camping teaches a vital lesson to children to know the importance of togetherness and socialization with people and feel real emotion and connection. 4. Camping helps build character through independence and teamwork. Besides gaining friends and learning the value of being alone with themselves, your children will get a sense of realization of their character and personality through the trials of being outdoors. When they get to experience hardships and difficulties, they will learn to be resilient in times when they are on their own and be involved when they are in a group or team. These experiences teach confidence and make them feel empowered as they take roles and responsibilities that will make them better members of society as they grow up. 5. Camping promotes health and wellness. Aside from emotional and mental health benefits, camping can be physically healthy for the kids as well. Being outdoors lets them engage in different exciting activities such as climbing trees, hiking, swimming, and exploration. They can also get a much-needed workout through fun tasks such as collecting rocks for a fire pit, gathering woods and building tents. All these are vital for your children’s overall fitness and health that you can provide naturally through camping! 6. Camping is an educational experience. Camping is never a boring activity for you and your kids. Every time you go out to camp, there will always be new and exciting experiences they will face and learn. As mentioned earlier, letting your children engaged in activities and tasks not only make their bodies fit but also make their brains healthy as well. Activities that require problem-solving skills and physical effort stimulates their brains making them more intellectual and capable in making decisions, especially in demanding situations. Because of this, it can help them build and increase their self-confidence that some children, unfortunately, lack nowadays. Also, they get to see nature directly and are likely to get interested in the life that is in it. Nothing beats witnessing firsthand the beauty of the stars during nighttime, the cloud formation in the sky, the bugs and animals in the wilderness and the plants and trees in the forest that will surely spark their curiosity – an experience, smartphone screens will never be able to deliver. While camping, you can bring your children close enough to see a deer run across the woods or the birds and fishes in their natural elements – animals in their purest and majestic form. Seeing animals in their natural habitat is one of the most exciting experience your kids can enjoy being outdoors. That raw feeling of awe and excitement will let them learn how to respect nature and be aware of and appreciate the life that revolves around it. As we already know, being outside is beneficial in so many ways for you and your kid. Camping is the best way for youngsters to awaken their innate instinct to reconcile with nature. They get to build a sense of connection with all the plants, trees, and all living organisms in the wildlife, making them more passionate when it comes to the conservation and protection of nature and environment. Camping is one of the easiest and friendliest ways your kids can learn survival skills to make them more resilient and resourceful in their daily lives. The challenges of camping and being outdoors let your kids learn the techniques and practical knowledge, especially in very challenging situations where resources are limited. When camping, you can take advantage of the opportunity to teach them navigation skills, pathfinding, and exploration to develop their sense of direction. Also, camping is the best time to guide them how to distinguish edible plants and find safe water sources, how to fish, and make fire from twigs and dead leaves for shelter and cooking food. At first, it can be inconvenient for your children but it can be extremely vital for them in the long run. Camping is an excellent and one of the cheapest options to go on vacation with your family. Your kids will get to enjoy each other’s company since being outside promotes bonding and quality time that is much needed for a child’s overall emotional and mental development. There is nothing more important than being close to your family. Your kids, above all, will learn that during hard times, they can rely on the help and guidance of their parents and siblings; giving them confidence and the love and care they deserve. As you can see, the benefits of camping are far better than the negatives. And before letting your kids enjoy their outdoor camping, be sure to look for very good tents so that you’ll be sure of their safety. Don’t hesitate to let your children experience the great outdoors! Author Bio: Shari Joyce is fond of traveling and doing outdoor activities from time to time together with her husband and daughter. She has tried hiking, cycling, camping, and even canyoneering, doing tons of adventures within the locality. She hopes to do outdoor activities in other countries.